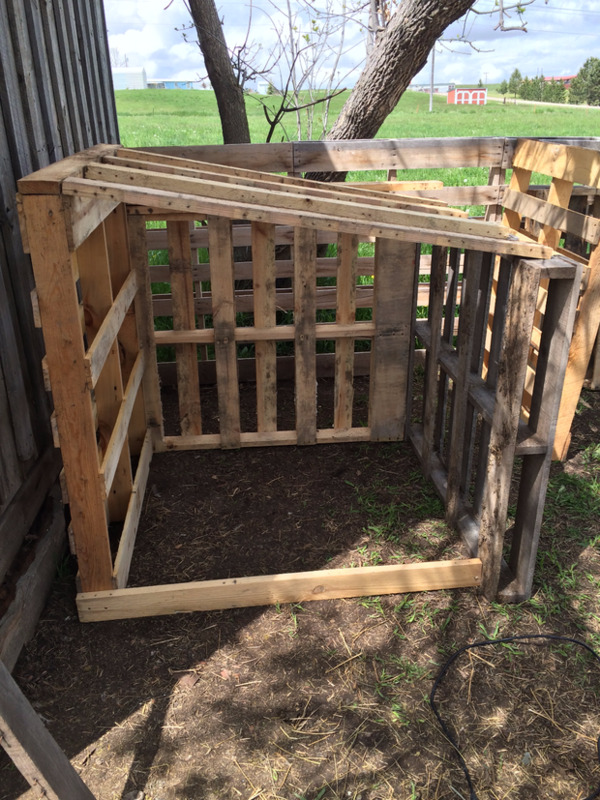 Below you will find an easy and brilliant way to build a goat house using pallets! 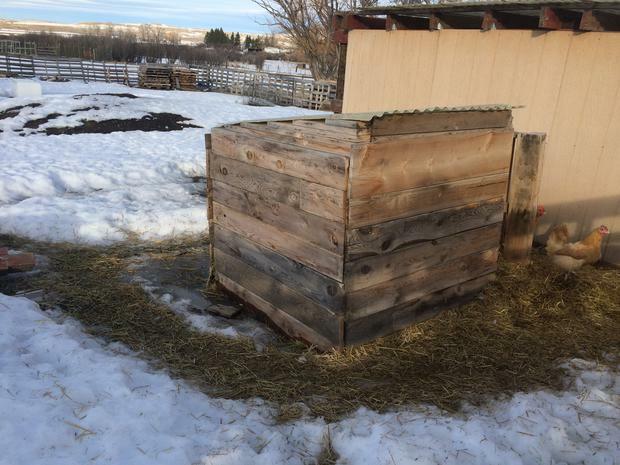 It’s a cost-effective way to use easy to find material to make great winter and out-of-the-rain shelters for your goats. 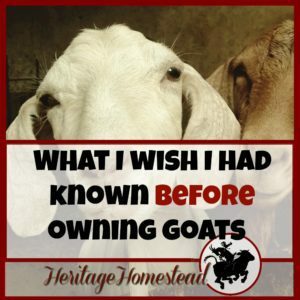 If you love your goats and are interested in more information, check out all of the information here: Raising Goats. Goats are a wonderful addition to a family! We appreciate them so much! But it was time to build them a sufficient goat shelter for winter. 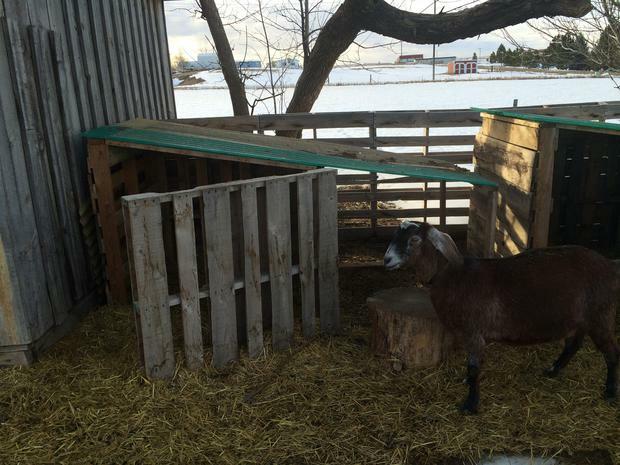 To answer the question, “Do goats need shelter in the winter”, yes, they do. Especially in our cold, snowy and windy climate. They do need protection from the elements as much as possible. 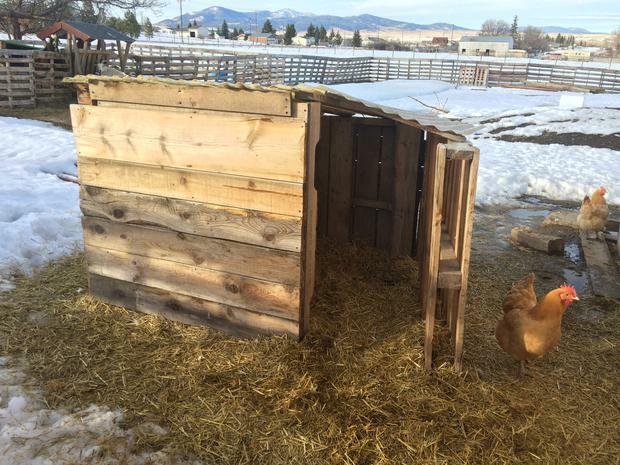 This summer, I spent some time building some goat shelters they could tuck into during the long, cold, deep winter drift days of Montana. Here is the outcome. They snuggle in and are quite happy! AND these are so simple to build! Pallets, at least around here, are easy to find and are free. They are small (compared to a barn) and the body heat from the animals keep it relatively warm. They can be moved and relocated if needed. They effectively provide shelter from the wind, rain, snow, and elements. I plan to reuse old rain gutters on the side. This will accomplish two things: keeping the runoff from hitting the sides and it will drain into a water trough that will give our goats and chickens another option of fresh water to drink. One pallet is standing so it is at its tallest and the other two pallets are on their sides. The pallets are then screwed together. A 2×4 is screwed to the bottom, front to hold it all together. The roofing material chosen is then screwed to the top. And I added a pallet on the front to help block the wind. Again, on these pallet goat houses, I added a pallet on the front to block the wind more. This size comfortably allows two goats to snuggle up together. Although after getting our buck, they all snuggle up together in one shelter. And I also screwed boards onto the outside walls to block more of the wind. Happy goats in the Montana winter! 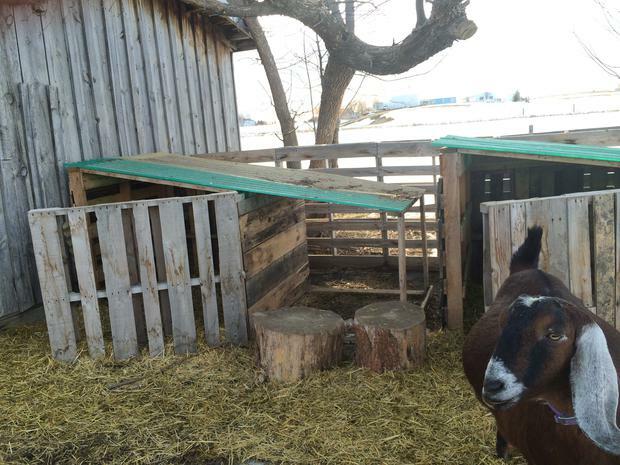 There are so many good ideas on how to make a goat shelter! For me, especially considering cost, these work best for us because we can always pick up free pallets in our area. And for these shelters, we had the roofing material given to us for free after a porch on a house was torn off. So really, I only paid for some screws. That works for me! 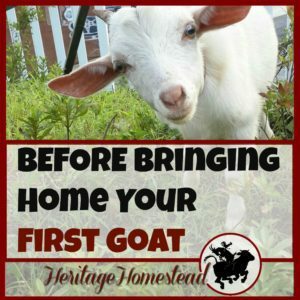 What goat housing has worked best for you? 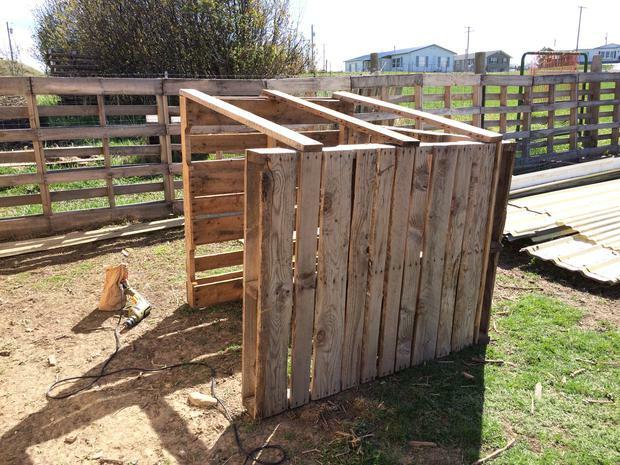 By far these are the cheapest and easiest Pallet Goat Shelters to build for your goats. 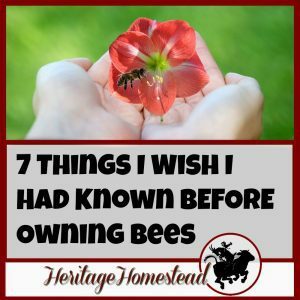 They are a perfect size and can be made very inexpensively and don't require a lot of room. 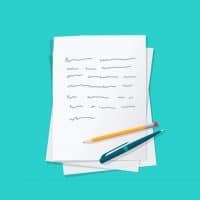 Follow this Pinterest Board for more great ideas and to see pictures of the ideas listed above. 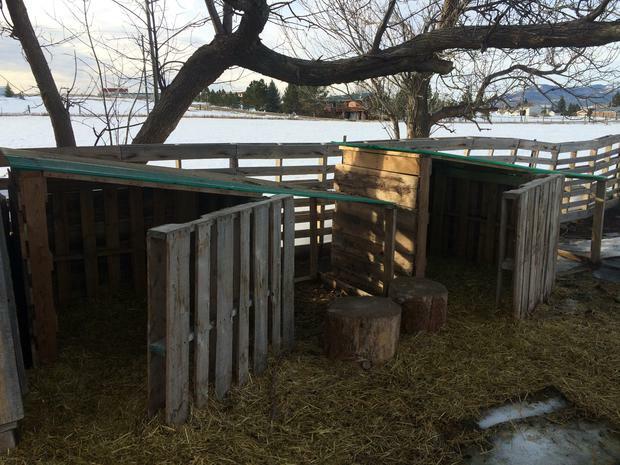 Your goats will need shelter from the rain, snow, wind, and elements. Goats, out of all the ruminants, struggle the most regulating their body temperature. Pneumonia Treatment and Signs (Video). 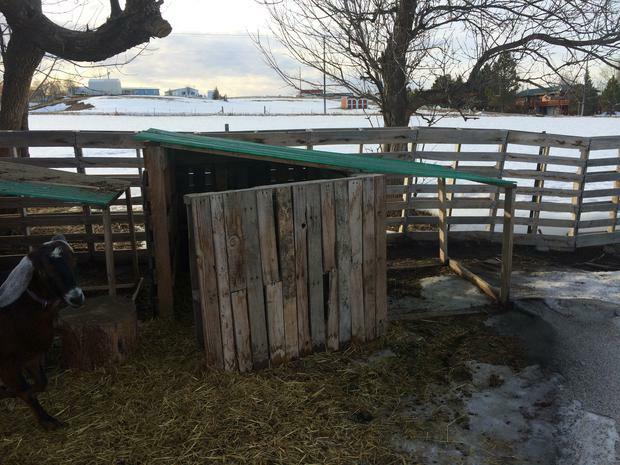 Careful thought about shelters will help keep your goats warm and dry, which decreases their risk of pneumonia (Post), which is the leading killer in goats. 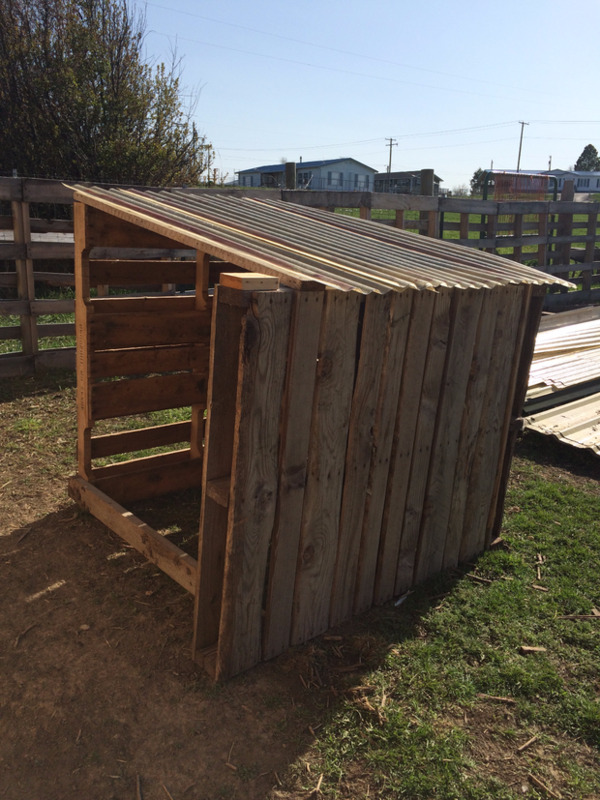 You may also want to check out this post on the goat feeder I built using pallet boards as well! I also realized that this shelter wasn’t big enough for my family of goats in the spring. 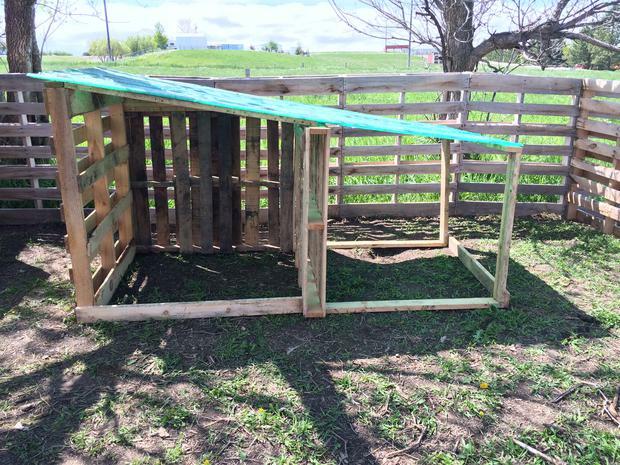 So I built a double sized goat shelter <=== Check it out and let me know what you think! Seriously, our free resource page is worth looking into! Check it out below! « CD&T Vaccination for Goats: Necessary or Not? 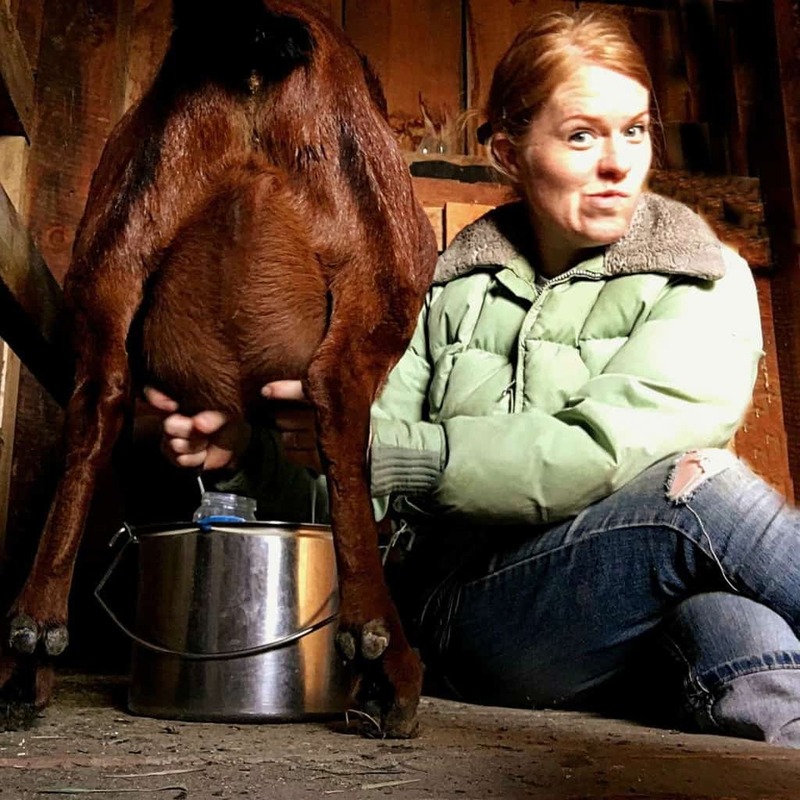 I am a beginner goat raiser and don’t know much about goat, but what about dearing the winter. Where I live it has really cold winters and I don’t want my goats to freeze. Hey Lexi! How exciting that you are just getting started with goats! I totally understand your concern about the winter months. I live in Montana and we have already been below zero this fall quite a bit. Your goats will need to be able to get out of the wind and off of the snow and dry. So your shelter needs to provide them that area. Adding straw where they can bed down and snuggle up together will be important as well. And keeping them healthy with mineral and nutrition will give them a healthy winter coat that will keep them warm as well. Always provide open water for them. I use a plugin heater to my water trough, this will not only keep the water open but will also encourage them to keep drinking on the cold days. Be so watchful for signs of pneumonia as well. The really cold days that warm up in the daytime, make it a perfect setup for them to get pneumonia. Just be prepared with your supplies so you can help them if need be. 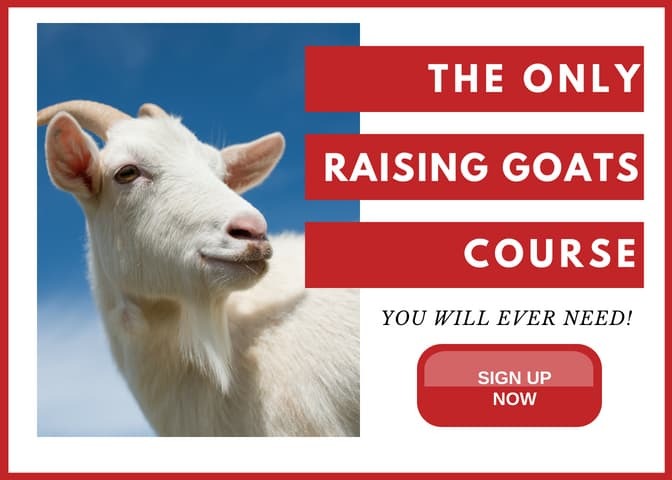 If you would like a bit of insight into beginning to raise goats you can get this 5-Day mini-course for free. 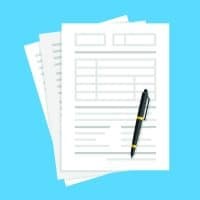 When you click “checkout” it will show as 0 is owed and will have videos, some printouts, and tools to help you feel more confident as you get started. 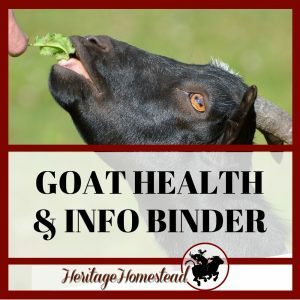 https://shop.alifeofheritage.com/discount/preparedgoatowner?redirect=%2Fproducts%2Fprepare-for-goats-5-day-mini-course I wish you all the best! If you have more questions, please feel free to ask! 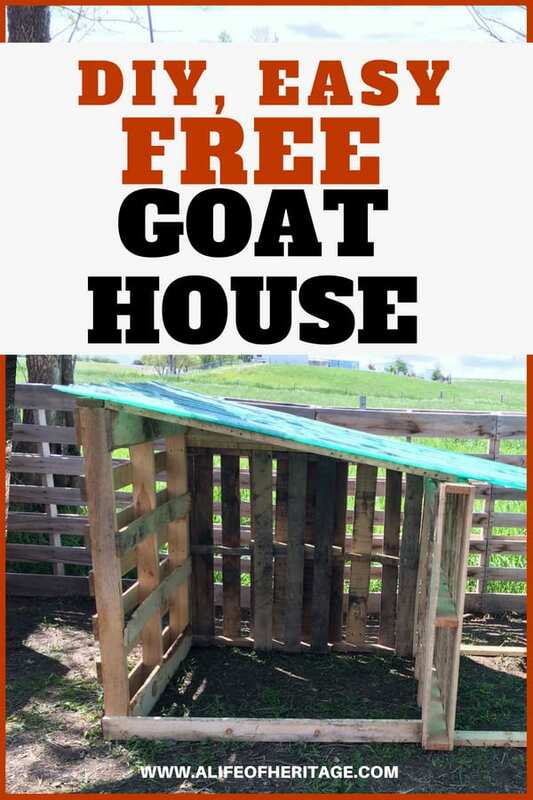 I would say that a goat house would be something like what this post shows or like the barn we also use during kidding. And a pen would be the outside area that they are enclosed into to keep them safe during the night (if predators aren’t an issue) or when you are gone. Thank you for posting these instructions. I am getting dwarf goats in May and my husband and I are gathering supplies now for the goat house. These instructions are easy to follow. We will have leftover metal roofing from our new roof, so we will use that for the roof (their house will match ours). That is so exciting and so great to be able to use the material you already have! I hope all goes well for you! Enjoy those goats!